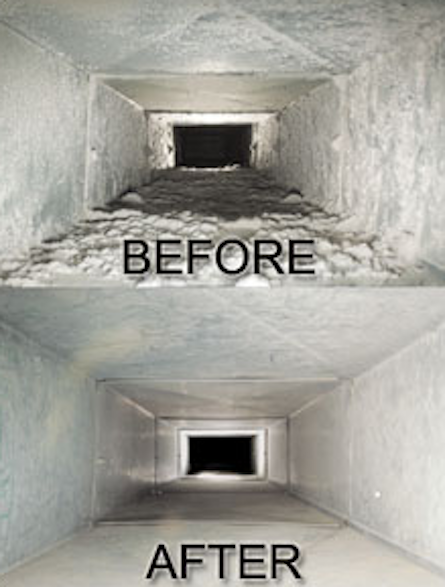 Air Duct Cleaning is one of the healthiest improvements that you can make to your home. After looking at the picture on this page and thinking about how long it has been since the air ducts in your home were cleaned, do you really doubt the need for this service? At Love Cleaning, we can help. Dust particles float around in the air in our homes and can carry microscopic allergens. This is just one reason why air duct cleaning is so important. For most of the year a home is closed up. Bacteria, molds, pollen, dust and smoke can become trapped in your carpet, furniture air ducts and furnace filter. When you add the presence of condensation, or high relative humidity, the potential for mold growth rises. A residential air duct cleaning job takes just a few hours and is a surprisingly clean and routine process. Dirty ducts can circulate odors and contaminates like mold and irritating dust throughout the home. If you are experiencing more allergy symptoms than usual you may want to clean your air ducts as preventative measure. Older duct work may be constricted by a build-up of hair from pets and humans, which catches other contaminants before they reach the furnace filter. Call us at 801-936-0586. Dirty duct work has the potential to make you or your family sick. Contaminants such as dust and moisture can build up inside the duct work creating a breeding ground for bacteria, mold, and fungi. Controlling moisture and regular cleaning are the most effective ways to prevent biological growth in all types of air ducts. Since the ventilation system is often the biggest culprit in poor indoor air quality, cleaning the duct work should be the first order of business. In most cases, your system has been operating for years without much attention.